A rendering of the proposed development, which would have 800 apartments, 180,000 square feet of office space, and 115,000 square feet of retail and community space. 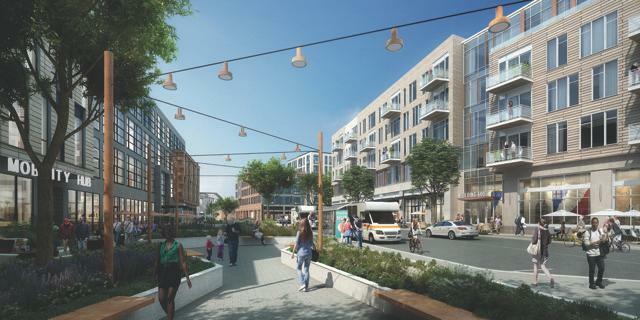 NEWTON — A proposed mixed-use development on Needham Street that could bring hundreds of new housing units divided residents during an hours-long public hearing Tuesday, as project supporters sparred with those concerned about the project’s size and traffic impact on the area. Northland Investment Corp.’s proposed project would be built on about 22 acres at the corner of Needham and Oak streets in Newton Upper Falls, an area already snarled by heavy traffic. Northland has reduced the scope of its project, and proposed a shuttle service and traffic improvement measures as part of its proposal. But some residents remain concerned over the size and scope of the development, said Leon Schwartz, who represented the neighborhood group Rightsize Newton. “You can’t simply artificially reduce the amount of parking spaces, and hope that this reduces traffic. What we have to do is reduce the overall size of the project,” Schwartz told councilors. Northland’s proposed 14-building development would have 800 apartments, including 123 affordable units, 180,000 square feet of office space, and 115,000 square feet of retail and community space. Northland said the development would have eight parks, a community building, a community playground, and a village green. Open space would make up 43 percent of the site. To address traffic issues, the developer is proposing a Transportation Demand Management system as part of the project. It would include a shuttle system with routes to Boston, Cambridge, and local stops at the Newton Highlands and Newton Centre MBTA subway stations, as well as the Newtonville commuter rail station. The city’s Planning Department is recommending additional steps to help manage traffic impacts, including having Northland pay for traffic improvements and for a feasibility study to analyze options for better MBTA service in the area, according to an April 5 memo to city councilors. City planners also were concerned about the effectiveness of the proposed shuttle service, and the department’s recommendations included ongoing monitoring of the number of vehicle trips throughout the life of the project. “Given the size of the project and existing conditions along Needham Street, reducing single-occupancy vehicle trips during peak commuting hours is critical,” the memo said. On Tuesday, residents packed the City Council chambers at Newton City Hall, where the public was allowed to address members of the council’s Land Use Committee. Jay Walter of another community group, Livable Newton, told city councilors he supported the Needham Street project. He said the project was an opportunity to bring residents to Newton who aren’t dependent on driving, plus create a new shuttle service system. “This is a good deal,” Walter told councilors. Katherine Kotik, who lives close to Needham Street, said the area is already “saturated” with housing developments, including Avalon At Newton Highlands, the Village Falls Condominiums, and more units across the Charles River in Needham. Kotik, who held a yellow sign that read “Not The Rightsize,” said in an interview she wanted to see a commercial development on the property. Josephine McNeil of West Newton said the Northland development was an opportunity to use the city’s inclusionary zoning bylaw to create more affordable housing. McNeil oversaw the Citizens for Affordable Housing in Newton Development Organization before she retired a few years ago. Julie Irish of Upper Falls said she would support a smaller mixed-use development on the property. “Something should go there [to] revitalize that area ... we would love something that would fit with the streetscape of a historic district,” she said. Jerry Riley of Upper Falls hasn’t made up his mind about the project, and attended Tuesday’s hearing to learn more, he said in an interview. There are parts he likes: He wants to see commercial activity on a now “derelict” property, plus Northland is proposing parks and community space with the development. But he’s concerned about the project’s size — which he described as “spookily large” — and its traffic impact. “Everybody in the neighborhood is trying to grapple with how a project this big can be done when Needham Street traffic is already horrendous,” Riley said.